So I found a little saying to help my oldest and soon youngest learn their planets. I had my kids cut out different sized planets, moons, stars, comets, meteorites, rings and a sun. 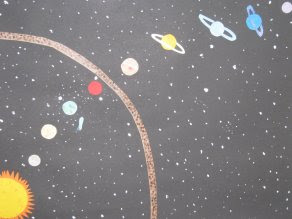 Then I had them place all of the "Solar System" on black poster paper and then glue each one to the paper. It was pretty fun craft to do. Of course I also went into the educational info a bit. I explained how our solar system is made up of the Sun and everything that orbits it, the nine (eight) planets (Pluto was changed from a planet to ‘The Dwarf Planet’ in 2006. Because it is so small many scientists don’t consider it a planet at all.) moving in elliptical orbits around it. There are also a lot of asteroids (small lumps of rock). Moons orbit the planets. Mercury and Venus are the only planets that do not have any moons. The Sun’s gravity keeps the planets and a variety of other objects, including comets, moving the way they do because of the Sun's orbit. Of course I am sure I will be explaining this many times in the future. But, all in all, it was a good day!